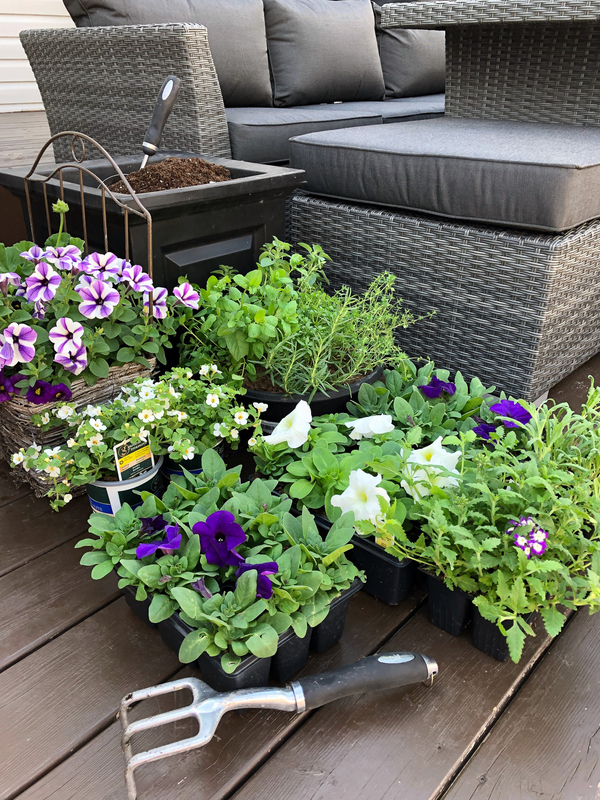 It’s the most wonderful time of year…it’s garden season! Let’s get our flower pots planted, and our gardens growing. 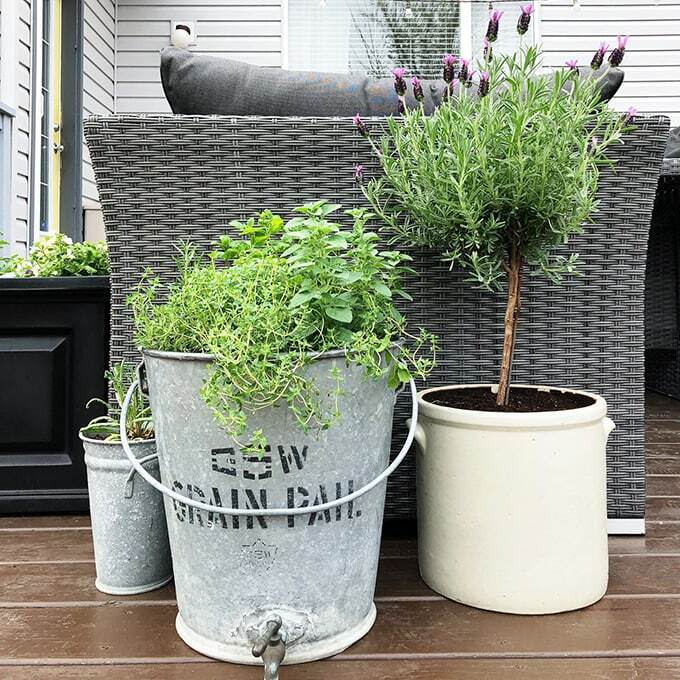 Here are 7 Inspirational Ideas for Beautiful Planters! Hello friends! It’s gardening season and I couldn’t be more excited! I can’t wait to dive in and get my hands dirty…it’s been a long winter and I’m craving flowers more than ever. 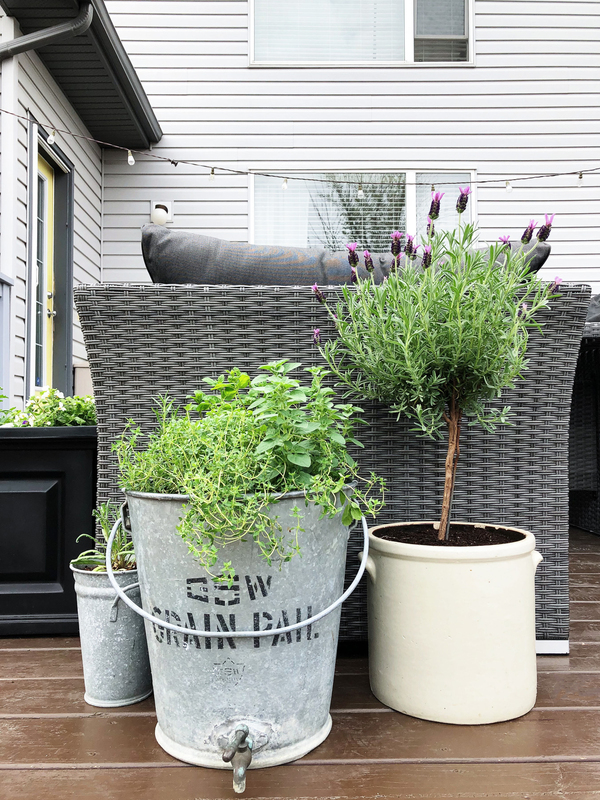 I’ve teamed up with some great blogger friends, and over the next few weeks, we are going to be sharing some outdoor spring ideas to inspire you! I am super excited to be taking part in this fun Outdoor Extravaganza Hop, hosted by Shauna of Satori Design for Living! 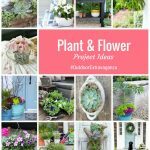 Make sure to scroll to the end of this post to see more plant & flower ideas from my blogging friends. 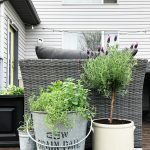 Over the years I have changed the way I garden, and have put all of my gardening efforts into a container garden on my back deck and patio area. This is due to a number of reasons, but mainly because it’s easy, gorgeous and practical for me. I like being able to move around my garden to promote better growth, to protect it from weather, and for parties and gatherings, and having my garden in pots allows me to do that. 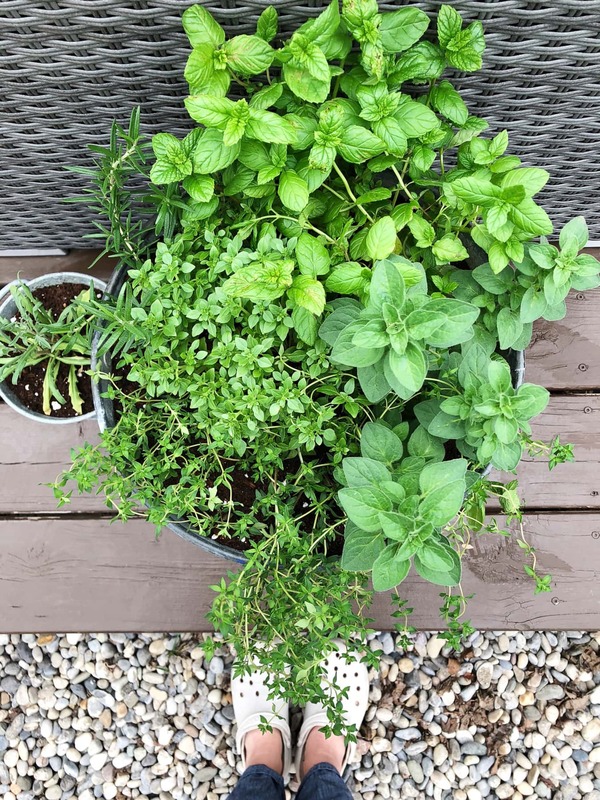 In my container garden, I plan to have about 15 assorted pots filled with flowers, herbs and vegetables, all around my deck space and right out my back door. 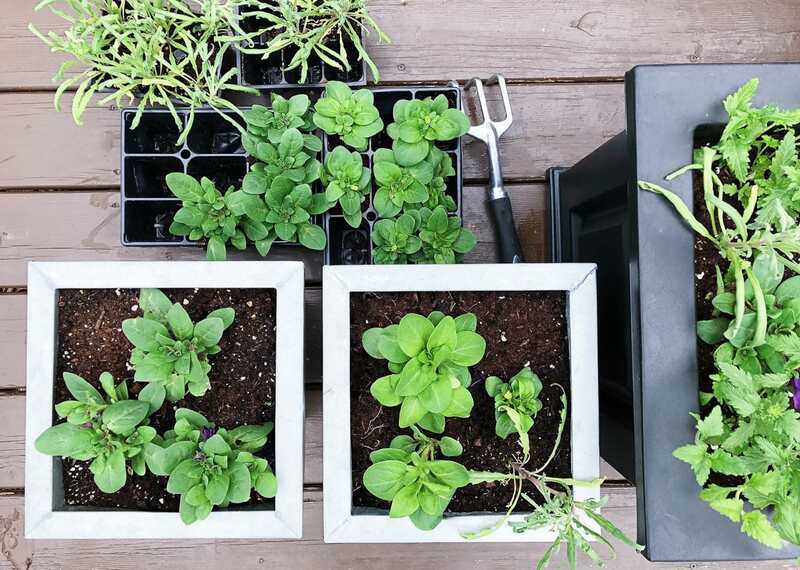 Container gardens are a wonderful and easy way to enjoy gardening. And they are great for everyone, no matter your space or gardening experience. 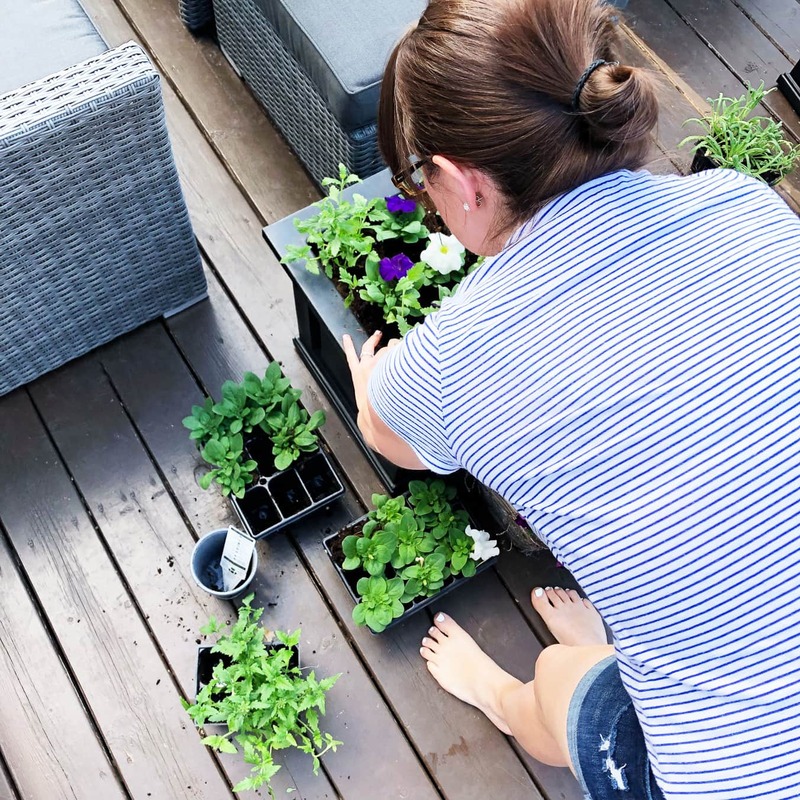 If you live in an apartment you can plant a container garden with planter boxes on your balcony, or if you’re in the city, decks make a perfect space for container gardens. The possibilities are endless. 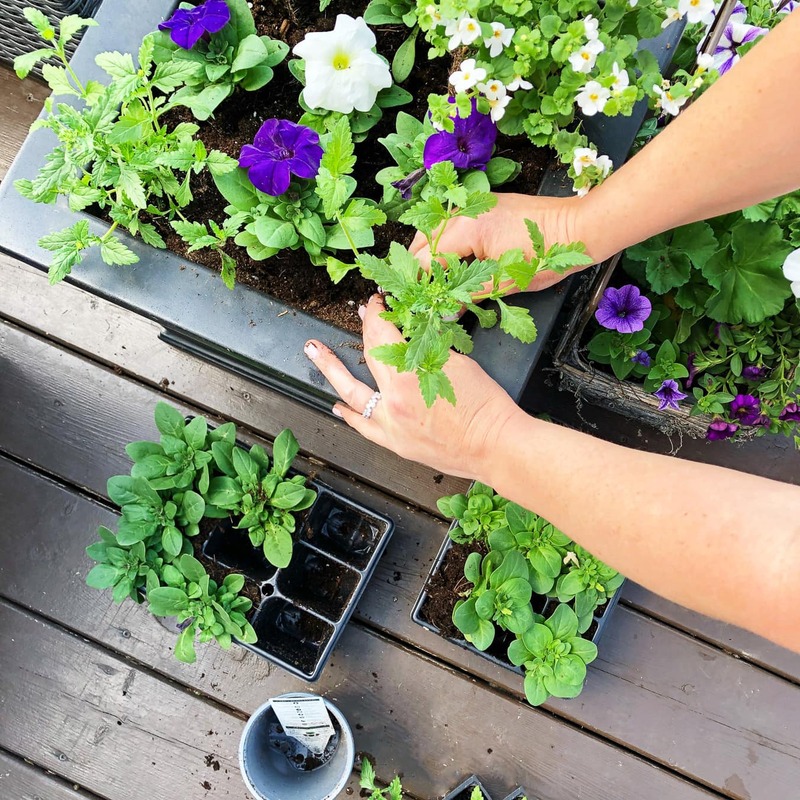 To have your best garden yet, I’m sharing some ideas to put together beautiful planters, plus tips and tidbits to keep your flowers blooming and beautiful all summer long. Creating beautiful planters is easy! The key is to keep the Thriller, Filler and Spiller rule in mind when putting your pots together. And keeping this gardening rule in mind is really handy when you are deciding what to plant in your containers. A thriller plant is your big, bold and beautiful centrepiece flower or grass. These are plants like ornamental grasses, lavatera, asters or dahlias. The filler plants are plants that fill in the space between the thriller and spiller plants, and compliment the thriller plant, but don’t overwhelm it. 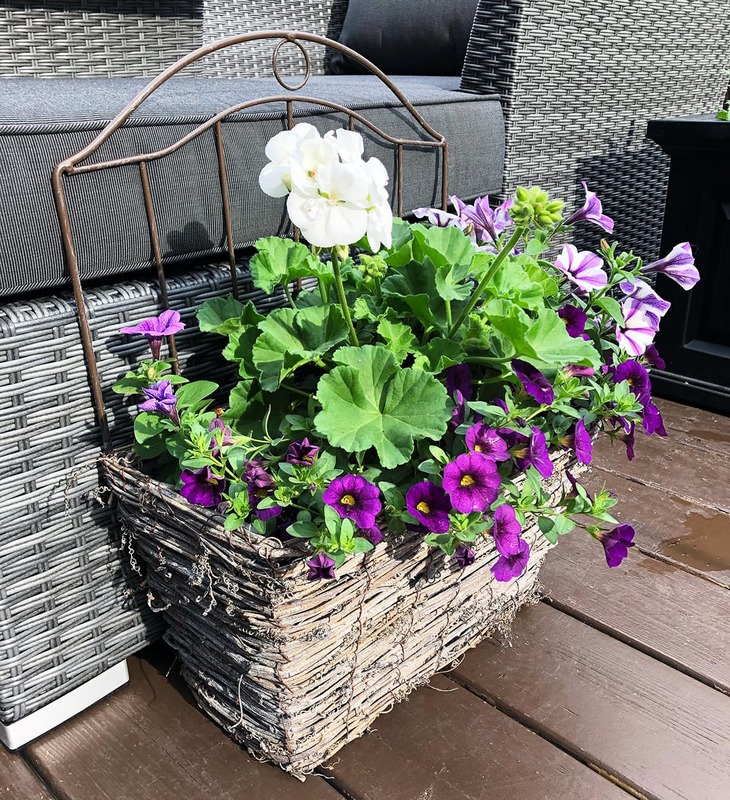 Examples of these types of plants are petunias, pansies, and geraniums. The spiller plant is the plant that is placed at the edge of the pot, and spills over the side of the container. These are plants like trailing verbena, bacopa or lobelia. My favourite planter combination, and one I go back to almost every year, is a pot full of petunias and bacopa. Pink petunias with white bacopa; or purple petunias with light purple bacopa are my favourite (purple petunias smell the best too!). A combination of petunias and trailing verbena looks really nice as well. Red petunias with purple trailing verbena or pink petunias with white & pink trailing verbena. 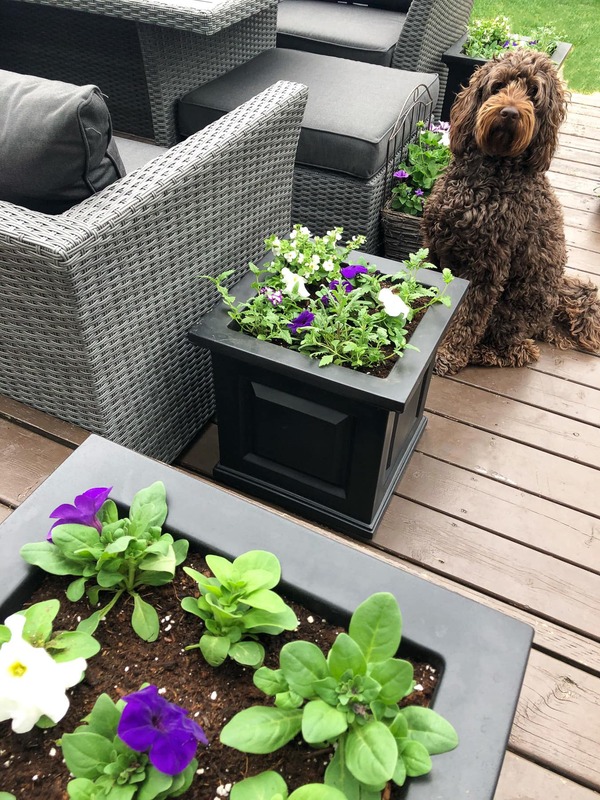 Sometimes I will also add in some bacopa (In the planter above, I’ve put purple and white petunias in the centre, and white bacopa and purple verbena in the corners). So pretty! Million Bells look like mini petunias, and are very popular right now. 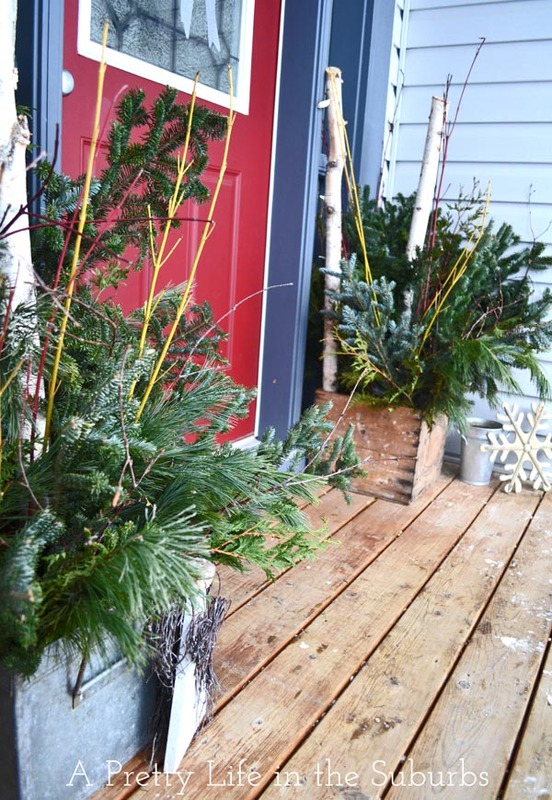 Fill a planter with one shade, or make a planter with multiple colours. Million Bells also look really nice with geraniums and petunias as shown in the planter above. Or if you want to make things extra easy for yourself, buy these arrangements already pre-made. This plant combination looks so lovely together. 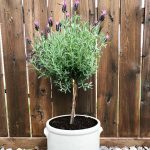 I made these planters last year, and they were gorgeous! By the end of the summer they were huge. 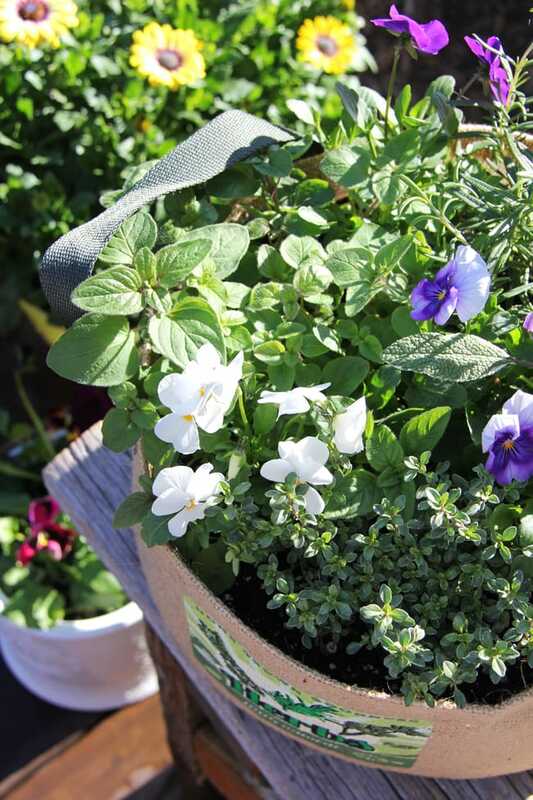 Herbs and pansies grow really well together and make a really pretty planter! I love planters that are functional and beautiful. 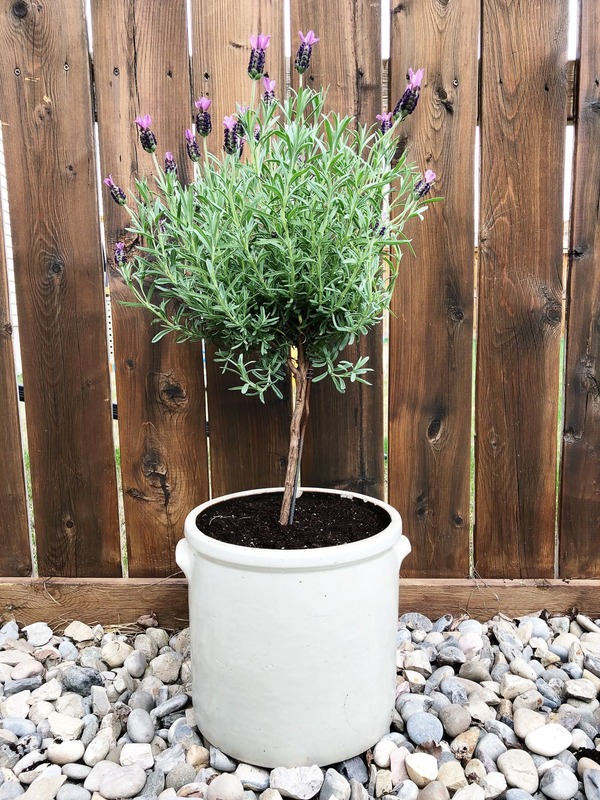 A pot of just lavender also looks amazing! Hostas, and small shrubs also make great statement planters. Sometimes the most simple arrangements end up being the most beautiful. Vegetables and flowers look great together too. Pretty and functional. I like to plant tomatoes and marigolds in the same pot…not only does this look nice but marigolds bring bees which pollinate the tomato plant. For fun I like to sneak in little unexpected plants like evening scented stock or violas into my flower pots. They add a nice visual touch, and the stock adds amazing scent! You can see the stock plant tucked into the corner of the planter above…once these planter grow in, the stock will blend in nicely. I hope you are now feeling inspired to get your garden growing! What are your favourite plant combinations? I’d love to know, so please feel free to leave a comment. More Plant and Flower Ideas! 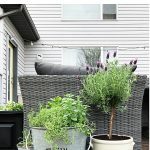 If you’re looking for more plant and flower ideas for your yard, I hope you take some time to check out these posts from my blogger friends! Another great way to see more is to follow the hashtag #OutdoorExtravaganza on Instagram! 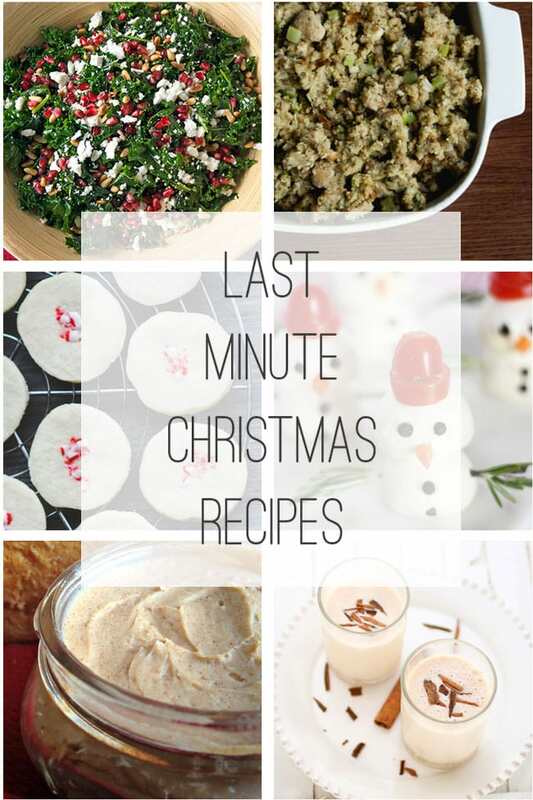 So many ideas for everyone. You’ve been busy! I started picking up a few annuals, but the crummy weather this week means I’ll have to wait for the weekend. I’ll definitely be checking out some of your suggestions the next time I’m at the garden centre. Hopefully it isn’t as dry as last summer. Most of my annuals were terrible looking by the end of July. One never knows what to plant! Yes I feel your pain! Gardening here is such an unknown! I thought last year I had things going smoothly, then fires and drought…this year, who knows?! I love your container gardens! Such great tips. That container with the spigot is so cute! Thank you Danielle! I really enjoy gardening this way! 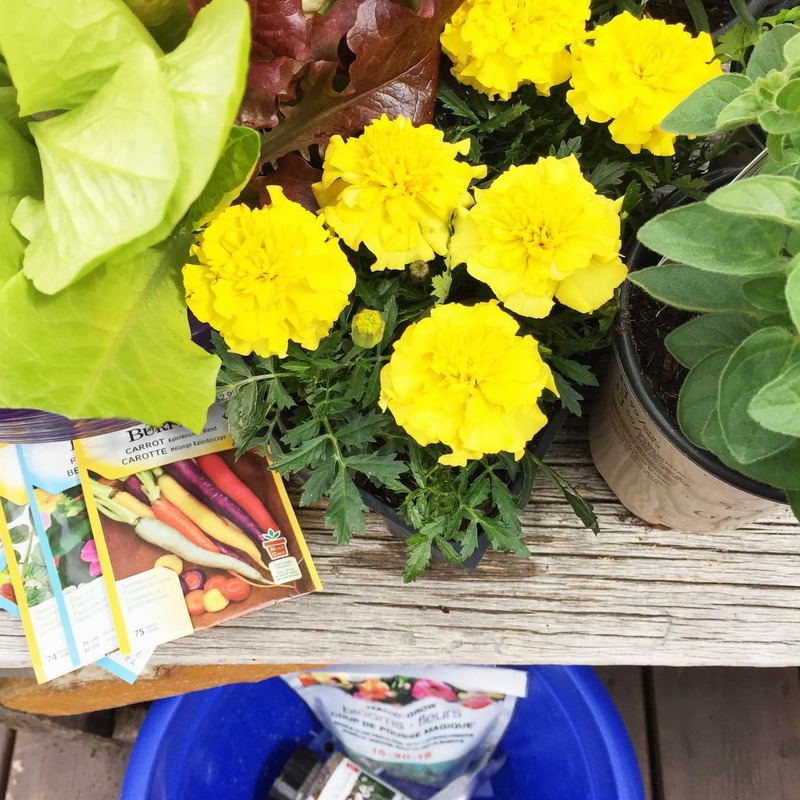 Great tips – I grow marigolds and tomatoes in containers and it never occurred to me to put them in the same pot. Thanks! Thank you Danielle! Happy Gardening! the pots look fantastic!!!! 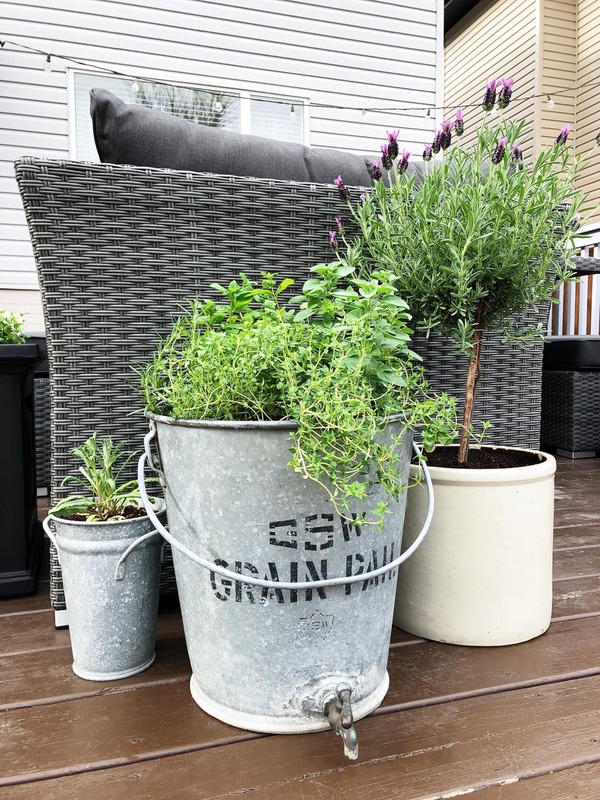 I like to hold off until after May long to plant (more cuz I procrastinate weeding my flower bed) but these def inspire me to do something with my pots sooner! Thank you Shelley!! I usually wait for May Long Weekend as well, but this year I just couldn’t stop myself! I have blankets at the door for frost watches!! I’m so happy you’re inspired to get gardening! So pretty! They’ll grow in beautifully! I find container gardening so much more manageable than having a big garden. 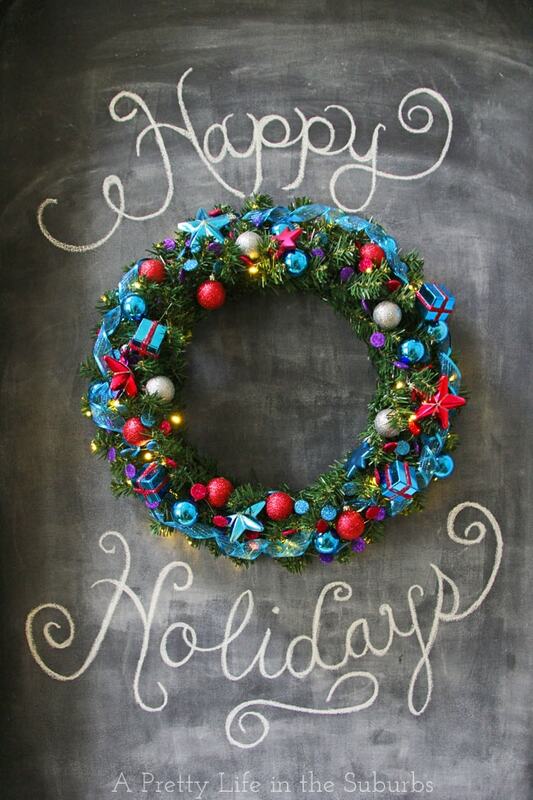 Enjoy your space! Thank you Jenn! I find it so much easier at this time in my life! Your deck is looking so pretty and ready for spring. Love your planters. So beautiful!!! Makes me want to head to HomeDepot this instant to buy some plants! Gorgeous planters and love the flowers.